These Tile China Markers will help you mark work tiles without leaving a permanent stain. Perfect for drawing a line for cutting or other applications, these grease type pencils are great for marking any glazed materials. Inkzall Black Fine Point Marker (4 PK) Inkzall Jobsite Markers feature clog resistant tips and the ability to write through dusty, wet or oily surfaces. The durable marker tips are designed for writing on rough surfaces such as OSB, cinder block and concrete and the ink dries quickly to reduce smearing markings, without drying out quickly when the cap is left off. For added user convenience, the Inkzall markers have a built-in hard hat clip for easy storage and access. Inkzall markers confirm to Milwaukee's commitment to best-in-class durability and their relentless mission to provide innovative solutions to the end user. 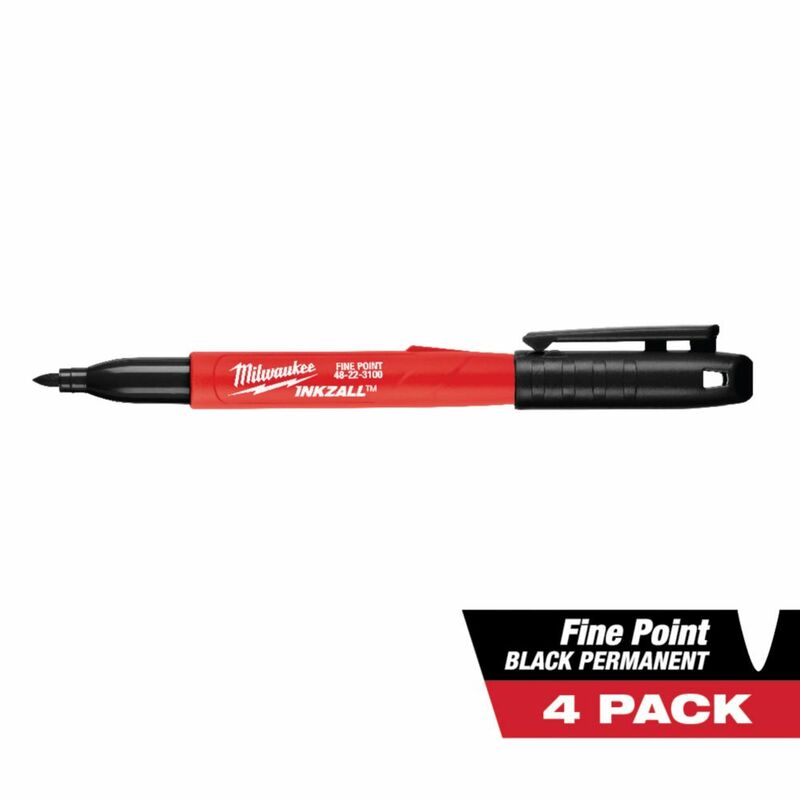 Inkzall Black Fine Point Marker (4 PK) is rated 4.5 out of 5 by 22. Rated 5 out of 5 by HomeDepotCustomer from better than sharpies.... better than sharpies. Rated 5 out of 5 by Andrew from It marks! ... It marks! Rated 4 out of 5 by George from A good marker. Tip doesn’t dry out. Very convenient... A good marker. Tip doesn’t dry out. Very convenient to be able to clip it on hat. Writes well on wet wood and through sawdust. I will be purchasing more. Rated 1 out of 5 by Speechless from I've been looking for a good replacement for Sharpie pens because they're not good anymore. I bou... I've been looking for a good replacement for Sharpie pens because they're not good anymore. I bought these because people seem to like them, but they are really bad. I used each one ONCE and they totally dried out. The description says "fast drying, no smearing" or something to that effect, but I had no idea that meant the pens would dry out so fast. Too expensive for a one-use item! Disappointed!! !